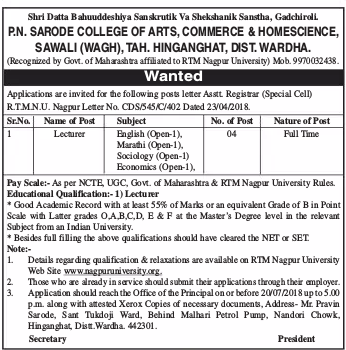 P.N.Sarode College of Arts, Commerce and Home Science, Wardha has advertised in Loksatta newspaper for the recruitment of Lecturer jobs vacancies. Interested and eligible job aspirants are requested to apply within 20th July 2018. Check out further more details below. About College: Shri Datta Bahu-Uddeshiy Sanskrutik va Shaikshnik Sanstha was established on 18th Sep 1998 In order to spread education & culture Activity at various level of the society. The founder president of the Shri Datta Bahu-Uddeshiy Sanskrutik va Shaikshnik Sanstha, Honorable Mr. Pravin N. Sarode. Our College is Maharashtra Government Recognized and Affiliated to RTM Nagpur University Nagpur.